Pre-assembled option: relay and socket are combined into one catalog number. Universal AC/DC sockets have built-in protection from transients and reverse polarity voltages . Accessories, which include isolators, ID tags, and bus jumper save valuable installation time. Square D™ Plug-In Relays. 8501K relays are designed for multipole switching applications at 240 Vac or lower. These relays have industry standard wiring and pin terminal arrangements which allow for their use as replacements for many competitive relays without wiring or hardware modifications. Pilot Light Option—Available on Types KP and KU. Internal pilot lights are available in both AC and DC versions for positive indication of power to the coil. The pilot light is a green LED. Square D™ Alternating Plug-In Relays. 8501KA alternating relay is designed to minimize pump and motor wear by equalizing run time between parallel components in a multi-pump system. The relay is controlled by an external control switch. The switch may be any type of contact closure; for example the contacts of a timing relay or the closure of a float switch. The 8501KA relay also has a toggle switch that allows the operator to lock one side of the duplex system in the “on” position. Square D™ Miniature Plug-in Relays. 8501R miniature plug-in relays have a 10 A resistive rating, the same as the Type K plug-in relays, but are much smaller. The compact size of these relays makes them ideal for downsizing equipment and applications where space is at a premium. 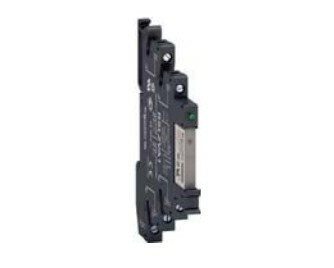 Download the Schneider Electric Relays and Timers PDF below or call 714.835.6211 for more information.